Real Madrid to offer two players in Eden Hazard deal? Real Madrid are reportedly considering the option of offering Mateo Kovacic and Isco in a potential deal to prise away Eden Hazard from Chelsea. The European champions have been constantly linked with the Belgium international over the past year and the speculation has recently intensified with his Blues contract expiring in 18 months' time. Amidst this, Onda Cero claims that the Spanish giants are planning an ambitious deal for the Belgium international, where they would be prepared to offer Kovacic - currently on loan with Chelsea and out-of-favour Isco in exchange. 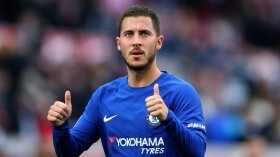 Hazard has been valued at around the £200m mark in the past six months and Los Blancos are hoping to at least reduce the valuation by half by discussing a part-exchange move. The attacker recently netted his ninth and tenth goal of the Premier League season as the Blues secured a hard-fought 2-1 triumph over Watford on the road. The victory sees the club maintaining the fourth spot in the standings.